According to Chicago ABC affiliate WLS-TV: "The funeral service for film critic Roger Ebert will be held Monday at Holy Name Cathedral in Chicago. The 10 a.m. service will be open to friends and fans of the beloved Chicago Sun-Times film critic, though seating will be limited. Open seats are first come, first served." Unfortunately, I won't be able to attend. 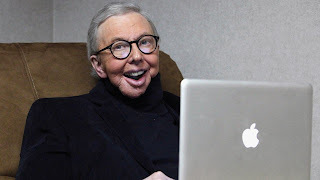 But I have a modest proposal: If you, like me, want to share your fond feelings for Roger, go to Twitter at 11 am ET/10 am CT Monday and Tweet his favorite email sign-off, "//Cheers, Roger" -- and add the hash tag: #RogerEbert. Why? Because Roger freakin' loved Twitter. So let's make him trend like no one else in Twitter history has ever trended before. Are you in? Then pass it on. OK, folks, let's make this happen. So the goodwishes are out there at the start of the services.